this GPSC Recruitment 2019. Online applications of GPSC AE Jobs will be accepted till 18-04-2019. Apply online for this GPSC AE recruitment 2019 @ https://gpsc-ojas.gujarat.gov.in/. Selection for this GPSC Assistant Engineer Mechanical recruitment will be through written exam (Prelims/ Mains exam) followed by Interview. 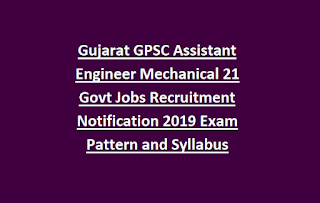 AE Mechanical Exam pattern, AE Jobs Exam Syllabus, Exam Syllabus PDF and other details of this GPSC Assistant Engineer Mechanical recruitment exam notification 2019 is updated below. 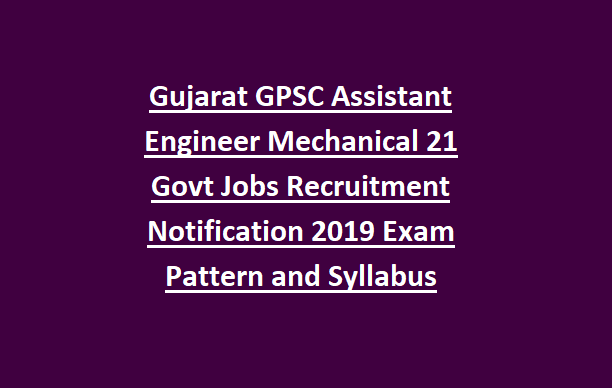 There are total 21 vacancies are in this GPSC AE Mechanical recruitment 2019. Age limits are 18-35 years for general candidates. For female, Ex Serviceman and all other category candidates upper age limit is 40 years. Civil Engineering Degree qualified candidates are eligible to apply online for this GPSC AE jobs in Narmada Water Resources Department. Application fee is Rs.100 for this AE posts of GPSC. Selection for this GPSC AE vacancies is through Prelims Exam (Screening test), Mains Exam and Interview. Eligible candidates can apply online for this GPSC AE jobs online on or before 18-04-2019. Official website to apply online for this AE Mechanical vacancies is https://gpsc-ojas.gujarat.gov.in.